Is 2008 the year I muster my strength and confront my demons? In other words, dare I get a haircut? Just before Christmas I was in Hongkong and I explored the old neighbourhoods of Yau Ma Tei. Looking again at this barber’s sign I encountered on those streets reaffirms my beliefs to stay out of the chair. 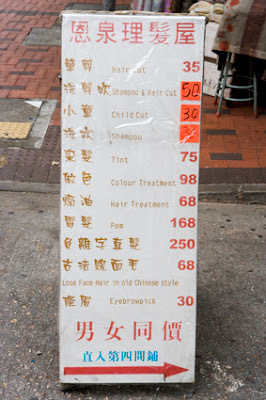 Apart from the Child Cut, which could come in handy in Hong Kong’s overcrowded tenements, Lose Face Hair in old Chinese style conjures up images of an ancient and refined torture method. I’ll give it a pass this year I think.